A friend asked me an interesting question the other day: Are you happiest when you are single or in a relationship? I almost shrugged her question off, seeing as it is a comical one, right? We are supposed to be happier in relationships. I should feel badly for myself, wondering if I’ll ever truly need to learn to cook. That’s the antiquated goal we all sign up for as a society, isn’t it? After I paused and really tried to answer the question, I found myself contemplating monogamy. I just kept picturing hardwood floors, when moments had passed before I looked at her, face deadpan, and shrugged again, wondering if all this shoulder-work counts as a gym day. For women especially, we’re all just sad spinsters and crazy cat ladies, shamed into repressing our masculine needs, you know like strength of self, risk-taking, and decisiveness. I bonded with the concept of romantic unity early on, and, not unlike the majority of Gen X, felt a sense of soul-loss with this first serious relationship-loss. Not going to lie, after I broke up with my first boyfriend and was single for the first time I went a little bananas. I was like a sexually repressed Amish teenager during a Miami Rumspringa. It’s just a phase, they said. You’re just rebounding, it’s normal, they protested. That may have been true, but I continued on my path of sexual and emotional destruction for over a year. I was at war with society. Nobody could make me feel less because I was single, because I enjoyed the empowerment and lack of pants. I became married to the idea of the single life (pun intended). “You were different. Not in a bad way, just more lively and seemed happier, more at peace with yourself” my friend remarked, remembering cherub-days spent calling each morning adventures and mistakes life lessons. Of being health conscious and fit, showering daily and eating chocolates on the actual day of Valentines. 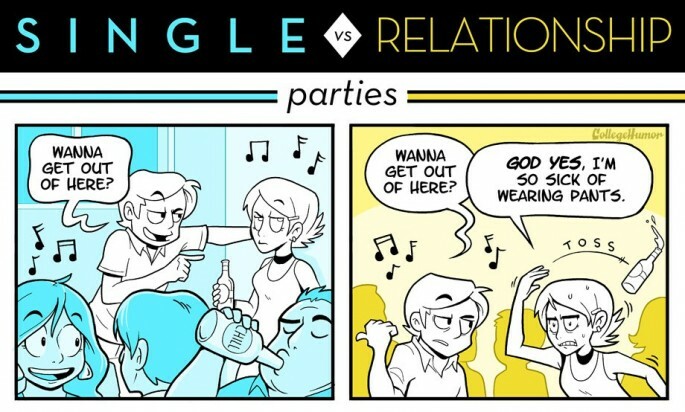 I have always been the painlessly single friend in a sea of couples. Chasing the sun with a half-drunk bottle of tequila and a fully drunk facial expression suited me well. Where they planned dates with the same person, struggling for innovate ideas, I was always trying something new with someone new. I found a sort of peace in the ideals of casual dating, of detachment. A peace in knowing where my relationships stood, what exactly I wanted out of them and with the sting of disappointment more a buzz than a viper. With peaks and valleys, on all frontiers, I continued to date again, to cup my precious, beating heart in my blue hands- a sacrificial offer to the gods and goddesses of romantic union and all things Ryan Gosling. To answer honestly I could imagine myself without anybody. Uprooting across the country, across the world, making new connections- pivoting my journey whenever I please. And as someone who has often been quoted as being an acquired taste, I feel even more capable of carving through any professional, romantic, platonic, familial, and unfamiliar landscape. The real doggy bag message here is that I could live without this person, but the choice is up for me to make. To love is to choose is to find joy. Singular affection disorder is a different kind of happiness, one of self-commitment, lustful passion, and a sliding scale for stability. It doesn’t matter who you invite into your life, as long as they RSVP and take you as their plus one. Be your bad self, be your best self, be with YOURSELF, listen to your inner-self, and during Christmas, don’t forget the elf’s opinions of the self. Whether your stilettos are at war with the dust on your top shelf, or handy and in commission, to each her own happiness. And remember, the only ship that doesn’t sink is courtship.